Understand the different types of ceremonial speeches. Explain how to deliver a strong ceremonial speech in different contexts. 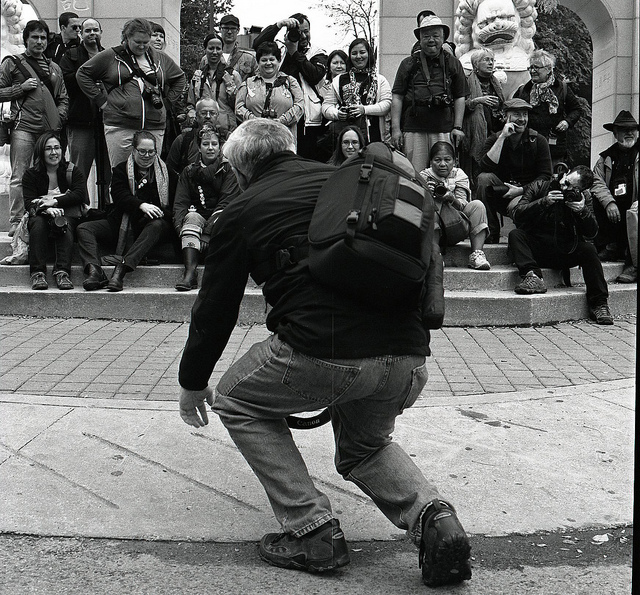 Alan Bell – Entertaining – CC BY-NC-ND 2.0. There are many occasions in which one may be called to speak that do not focus on informing or persuading an audience in the ways we’ve already discussed. Special occasions mark life events, celebrate milestones, and commemorate people and situations. The speeches delivered at these types of events provide perspective on the occasion, help the audience make sense of its significance, and can become a lasting part of the memories formed from the event. Whether you are standing up to give an award speech, a wedding toast, or a eulogy, knowing how to deliver speeches in a variety of different contexts is an important skill of public speaking. In this chapter, we will explore the functions of special occasion speeches, as well as several specific types of special occasion speeches, and four key items to remember when you are asked to deliver one these speeches at an event. 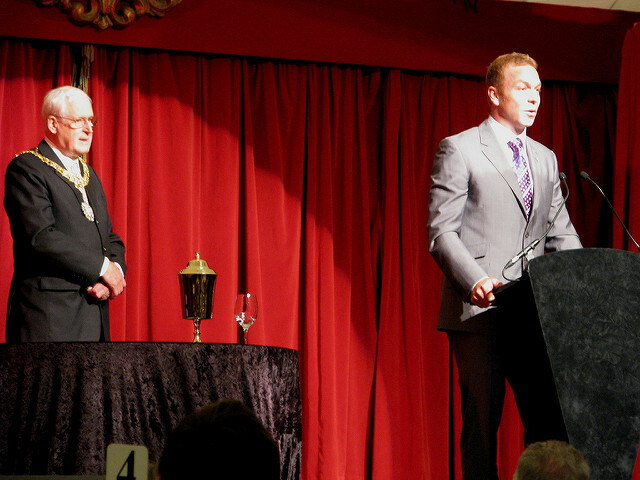 Chris Hill – Chris Hoy – Acceptance Speech – CC BY-NC-ND 2.0. While speeches intended to entertain an audience may be either informative or persuasive, the rhetorical situation often provides a clear indication of when a speech falls into the special occasion category. Consider roasts and toasts; both entertain and celebrate, albeit in different ways. An awards banquet and weddings are examples of special occasions that call for a speaker to present an upbeat, light speech designed to amuse the audience while celebrating a person, event, or situation. When we think of a speech crafted to commemorate something or someone, perhaps a eulogy is the first type to come to mind. That is likely because a commemorative speech is one of tribute, and often remembrance, such as a eulogy or when a speaker recalls an anniversary or a milestone event. Speeches of commemoration can also include building or monument dedications that are designed to honor the memory of the person or situation that inspired the site. Often the rhetorical situation calls for a speaker to present words of wisdom and guidance based upon their personal experiences or what they’ve learned through shared experiences of the audience they are addressing. Examples of this kind of inspirational speaking include one you’ve all likely already witnessed, the commencement speech. Another example is a keynote address at a conference or convention. An inaugural address is another type of speech designed to inspire audiences through the promise of the speaker’s vision for the future. This textbook is dedicated to encouraging students to stand up and speak out and this type of special occasion speech encompasses the speeches in which individuals do just that. Speeches of advocacy focus on goals and values. They are often cause-oriented or crafted to impact policy-setting or change in some way. Speakers present advocacy speeches at special occasions such as fundraisers, campaign rallies, and even protests or marches. If we consider the functions of special occasion speeches we’ve just reviewed, chances are we could come up with a myriad of different types of speeches that could be included in this section. For our purposes, we are going to focus on several special occasion speeches that you are likely to encounter in your academic, professional, and personal lives. By looking at common types of speeches, we hope to enable you with the tools to stand up and speak out in events and situations in which you may find yourselves given a platform to deliver a speech. The first type of speech is called the speech of introduction. A speech of introduction is a short speech that introduces another speaker. There are two main goals of an introduction speech: to provide a bit of context, including who the speaker is and why that speaker will be giving a speech at the particular event, and to entice the audience to pay attention to what the speaker has to say. Just like any other speech, a speech of introduction should have a clear introduction, body, and conclusion. The information should be delivered as concisely but informative as possible. For an introduction, think of a hook that will make your audience interested in the upcoming speaker. Did you read a news article related to the speaker’s topic? Have you been impressed by a presentation you’ve heard the speaker give in the past? You need to find something that can grab the audience’s attention and make them excited about hearing the main speaker. The body of your speech of introduction should be devoted to telling the audience about the speaker’s topic, why the speaker is qualified, and why the audience should listen (notice we now have our three body points). First, tell your audience in general terms about the overarching topic of the speech. You may only have a speech title and maybe a paragraph of information to help guide this part of your speech. Remember, your role is to be concise and to the point. The speaker is the one who will elaborate on the topic. Next, you need to tell the audience why the speaker is a credible speaker on the topic. Has the speaker written books or articles on the subject? Has the speaker had special life events that make him or her qualified? Think about what you’ve learned about building ethos and do that for the speaker. Lastly, you need to briefly explain to the audience why they should care about the upcoming speech. The final part of a good introduction speech is the conclusion. The conclusion is generally designed to welcome the speaker to the lectern. Many introduction speeches will conclude by saying something like, “I am looking forward to hearing how Joe Smith’s advice and wisdom can help all of us today, so please join me in welcoming Mr. Joe Smith.” We’ve known some presenters who will even add a notation to their notes to “start clapping,” “shake the speaker’s hand,” or “give the speaker a hug” depending on the circumstances of the speech. The second type of ceremonial speech is the speech of presentation. A speech of presentation is a brief speech given to accompany a prize or honor. A speech of presentation could be as simple as saying, “This year’s recipient of the Schuman Public Speaking prize is Wilhelmina Jeffers,” or could last up to five minutes as the speaker explains why the honoree was chosen for the award. When preparing a speech of presentation, it’s always important to ask how long the speech should be. Once you know the time limit, then you can set out to create the speech itself. First, you should explain what the award or honor is and why the presentation is important. Second, you can explain what the recipient has accomplished in order for the award to be bestowed. Did the person win a political race? Did the person write an important piece of literature? Did the person mediate conflict? Whatever the recipient has done, you need to clearly highlight their work. Lastly, if the race or competition was conducted in a public forum and numerous people didn’t win, you may want to recognize those people for their efforts as well. While you don’t want to steal the show away from the winner (as Kanye West did to Taylor Swift during the 2009 MTV Music Video Awards (https://vimeo.com/173170491), you may want to highlight the work of the other competitors or nominees. The complement to a speech of presentation is the speech of acceptance. The speech of acceptance is a speech given by the recipient of a prize or honor. For example, in the above video clip from the 2009 MTV Music Video Awards, Taylor Swift starts by expressing her appreciation, gets interrupted by Kanye West, and ends by saying, “I would like to thank the fans and MTV, thank you.” While not a traditional acceptance speech because of the interruption, she did manage to get in the important parts. There are three typical components of a speech of acceptance: thank the givers of the award or honor, thank those who helped you achieve your goal, and put the award or honor into perspective. First, you want to thank the people who have given you the award or honor and possibly those who voted for you. We see this done every year during the Oscars, “First, I’d like to thank the academy and all of the academy voters.” Second, you want to give credit to those who helped you achieve the award or honor. No person accomplishes things in life on their own. We all have families, friends, and/or colleagues who support us and help us achieve what we do in life. A speech of acceptance is a great time to graciously recognize those individuals. Lastly, put the award in perspective. Tell the people listening to your speech why the award is meaningful to you. The fourth ceremonial speech is the speech of dedication. A speech of dedication is delivered when a new store opens, a building is named after someone, a plaque is placed on a wall, a new library is completed, and so on. These speeches are designed to highlight the importance of the project and those to whom the project has been dedicated. When preparing the speech of dedication, start by explaining your connection to the project and why you’ve been asked to speak. Next, you want to explain what is being dedicated and who was involved with the project, who made it possible. If the project is a new structure, talk about the people who built the structure or designed it. If the project is a preexisting structure, talk about the people who put together and decided on the dedication. You also want to explain why the structure is important and the impact it may have on the local community. For instance, if the dedication is for a new store, you could talk about how the store will bring in new jobs and shopping opportunities. If the dedication is for a new wing of a hospital, you could talk about how patients will be served and the advances in medicine the new wing will provide the community. It is likely that if you haven’t yourself given a toast at this point in your life, you’ve witnessed one at a social event. A toast is a speech designed to congratulate, appreciate, or remember. Toasts can be delivered for the purpose of congratulating someone for an honor, a new job, or getting married. You can also toast someone to show your appreciation for something they’ve done. We also toast people to remember them and what they have accomplished. Think about a time when you may have heard someone exclaim “let’s raise our glass!” in honor of someone who may or may not be present at that moment. When preparing a toast, the first goal is always to keep your remarks brief. Toasts are generally given in the course of some festivity (e.g., wedding, retirement party, farewell party), and you don’t want your toast to take away from the festivity for too long. Second, the goal of a toast is to focus attention on the person or persons being celebrated—not on the speaker. As such, while you are speaking you need to focus your attention on the people you are toasting, both by physically looking at them and by keeping your message about them. You should also avoid any inside jokes between you and the people being toasted because toasts are public and should be accessible for everyone who hears them. To conclude a toast, simply say something like, “Please join me in recognizing Joan for her achievement.” While that will verbally signal the conclusion of the toast, some occasions may also call for you to physically raise your glass in the direction of the honoree. This action will invite the audience to join in the toast. A roast is an interesting and peculiar speech because it is designed to both praise and good-naturedly poke fun at a person being honored. Generally, roasts are given at the conclusion of a banquet in honor of someone’s life achievements. The television station Comedy Central has created a series of celebrity roasts which showcases public figures jokingly insulting other well-known figures in front of a live audience. In this clip (https://www.youtube.com/watch?v=BSE_saVX_2A#action=share), watch as Stephen Colbert, television host of The Colbert Report, roasts President George W. Bush. How does one prepare for a roast? You want to think about the person who is being roasted. Do they have any strange habits or amusing stories in their past that you can discuss? When you think through these things, you want to make sure that you cross anything off your list that is truly private information or will really hurt the person. The goal of a roast is to poke fun at them, not embarrass them or tarnish their reputation. When selecting which aspects to highlight in your roast, you want to make sure that the items you choose are widely known by your audience. Roasts work when the majority of people in the audience can relate to the jokes as these are intended to create a fun atmosphere for all. It is up to the speaker to ensure neither the individual being roasted or the audience, is left feeling uncomfortable. Always remember the point of a roast is to honor someone. While the jokes are definitely the fun part of a roast, you should leave the roastee knowing that you truly do care about and appreciate them. A eulogy is a speech given in honor of someone who has died. If you are asked to deliver a eulogy, it’s important to understand the expectations of this type of speech and ensure you are prepared. You need to be prepared both for the sake of the audience as well as your own. Watch the following clip (https://www.youtube.com/watch?v=pRsH92sJCr4&feature=youtu.be) of then-Senator Barack Obama delivering a eulogy at the funeral of civil rights activist Rosa Parks in November of 2005. In this eulogy, Senator Obama delivers the eulogy by recalling Rosa Park’s importance and her legacy in American history. When preparing a eulogy, first you need to know as much information about the deceased as possible. The more information you have about the person, the more personal you can make the eulogy. While you can rely on your own knowledge if you were close to the deceased, it is always a good idea to ask friends and relatives of the deceased for their memories. Other people’s input may add important facets that may not have occurred to you. Of course, if you were not very close to the deceased, you will need to ask friends and family for information. Second, although eulogies are delivered on the serious and sad occasion of a funeral or memorial service for the deceased, it is very helpful to look for at least one point to be lighter or humorous. In some cultures, in fact, the friends and family attending the funeral will expect the eulogy to be highly entertaining and amusing. While eulogies are not roasts, one goal of the humor or lighter aspects of a eulogy is to relieve the tension that is created by the serious nature of the occasion. Lastly, remember to tell the deceased’s story. Tell the audience about who this person was and what the person stood for in life. The more personal you can make a eulogy, the more touching it will be for the deceased’s friends and families. The eulogy should remind the audience to celebrate the person’s life as well as mourn their death. A speech of farewell allows someone to say goodbye to one part of their life as they move on to the next part of life. Maybe you’ve accepted a new job and are leaving your current job, or you’re graduating from college and entering the workforce. Whatever the case may be, periods of transition are often marked by speeches of farewell. Watch the following clip (https://youtu.be/HJrlTpQm0to) of Derek Jeter’s 2008 speech saying farewell to Yankee Stadium, built in 1923, before the New York Yankees moved to the new stadium that opened in 2009. In this speech, Derek Jeter is not only saying goodbye to Yankee Stadium but also thanking the fans for their continued support. When preparing a speech of farewell, the goal should be to thank people and let them know how much you appreciate them as you make the move to your next role in life. In Derek Jeter’s speech, he starts by talking about the history of the 1923 Yankee Stadium and then thanks the fans for their support. You will also want to express to your audience how much the experience has meant to you. A farewell speech is a time to commemorate and think about the good times you’ve had, not recount any less pleasant aspects. It’s a good idea to end on a high note. Derek Jeter concludes his speech by saying, “On behalf of this entire organization, we just want to take this moment to salute you, the greatest fans in the world!” At this point, Jeter and the other players take off their ball caps and hold them up toward the audience. The goal of an inspirational speech is to elicit or arouse an emotional state within an audience. Although other speeches we’ve already explored can incorporate inspirational messages, we will now look at two specific types of inspirational speeches: goodwill and speeches of commencement. Goodwill is an intangible asset that is made up of the favor or reputation of an individual or organization. Speeches of goodwill are often given in an attempt to get audience members to view the person or organization more favorably. Although speeches of goodwill are persuasive, they try not to be obvious about the persuasive intent. They are often delivered as information-giving speeches that focus on an individual or organization’s positive attributes. The second type of inspirational speech is the speech of commencement, which is designed to recognize and celebrate the achievements of a graduating class. Nearly all of us have sat through commencement speeches at some point in our lives. Perhaps you just finished high school and earned your degree, or you recently attended a commencement for a sibling or other family member. If you have not yet attended a commencement ceremony, you will soon as you work toward earning your college degree. Numerous celebrities and politicians have been asked to deliver commencement speeches at colleges and universities. One famous commencement speech was given by famed Harry Potter author J.K. Rowling at Harvard University in 2008 (https://www.youtube.com/watch?v=nkREt4ZB-ck). J.K. Rowling’s speech has the perfect balance of humor and inspiration, which are two of the main ingredients of a great commencement speech. If you’re ever asked to deliver a commencement speech, there are some key points to think through when deciding on your speech’s content. If there is a specific theme for the graduation, make sure that your commencement speech addresses that theme. If there is not a specific theme, come up with one for your speech. Some common commencement speech themes are commitment, competitiveness, competence, confidence, decision making, discipline, ethics, failure (and overcoming failure), faith, generosity, integrity, involvement, leadership, learning, persistence, personal improvement, professionalism, reality, responsibility, and self-respect. Talk about your life and how graduates can learn from your experiences to avoid pitfalls or take advantages of life. How can your life inspire the graduates in their future endeavors? Make the speech humorous. Commencement speeches should be entertaining and make an audience laugh. Be brief! Remember, the graduates are there to get their diplomas, and their families are there to watch the graduates walk across the stage. Remember, while you may be the speaker, you’ve been asked to impart wisdom and advice for the people graduating and moving on with their lives, so keep it focused on them. Place the commencement speech into the broader context of the graduates’ lives. Show the graduates how the advice and wisdom you are offering can be utilized to make their own lives better. Overall, it’s important to make sure that you have fun when delivering a commencement speech. Remember, it’s a tremendous honor and responsibility to be asked to deliver a commencement speech. Take the time to really think through and prepare your speech. Acumen_ – Keynote Speech – CC BY-NC-ND 2.0. The last type of special occasion speech we will examine is the keynote speech. A keynote speech is delivered to set the underlying tone and summarize the core message of an event. People who deliver keynote speeches are typically experts in a given area who are invited to speak at a conference, convention, banquet, meeting, or other kinds of events with the purpose of setting a specific tone for the occasion. As mentioned, keynote speeches often are meant to inspire an audience. This inspiration can anything from motivating staff at a sales convention to discussing organizational values and imparting wisdom on a group with a shared goal or purpose. Some keynote speakers will work for a speakers bureau, an agency that represents celebrity and professional speakers. One important organization for all aspiring keynote speakers is the National Speaker’s Association, or NSA. (http://www.nsaspeaker.org). In the world of professional public speaking, there are two common types of keynotes: after-dinner speeches and motivational speeches. Let’s look at each of these unique speeches. Ironically, an after-dinner speech does not have to occur after a formal dinner, though it does get its name from the idea that these speeches historically followed a meal of some kind. After-dinner speakers are generally asked (or hired) to speak because they have the ability both to effectively convey a message and to make people laugh. This characteristic does not mean its only goal is to entertain. The after-dinner speech could serve any of the functions previously detailed in this chapter, and all the basic conventions of public speaking discussed in this text apply to after-dinner speeches. However, the overarching goal of these speeches is to entertain and create a light-hearted, jovial atmosphere. After-dinner speaking is a challenging type of speaking because it requires a balance of entertainment and humor by providing substantive insight into the topic of the event or situation. Finding this balance will allow speakers to deliver a rewarding speech that leaves a lasting impact on the audience. For an example of an after-dinner speech, read the following speech delivered by Mark Twain on his seventieth birthday: (https://www.pbs.org/marktwain/learnmore/writings_seventieth.html). Here are some things to consider when preparing an after-dinner speech. First, use all that you have learned about informative or persuasive speeches to prepare for this speech, and then consider the four items of note we will outline later in this chapter for creating a successful special occasion speech. You must prepare, consider the occasion, understand your audience, and be mindful of time constraints surrounding your speech and the event. Second, remember that this is not an opportunity to try your hand at stand-up comedy. The after-dinner speech has a specific goal or purpose, which you must identify and attempt to accomplish. Doing so requires that your speech has a recognizable structure like your more formal speeches: an introduction, a body, and a conclusion. While you ideally want to entertain and amuse your audience, you also want to be sure you achieve your speech goal in the given timeframe. The second common form of keynote speaking is motivational speaking. A motivational speech is designed not only to make an audience experience emotional arousal (fear, sadness, joy, excitement) but also to motivate the audience to do something with that emotional arousal. Whereas a traditional persuasive speech may attempt to influence listeners to purchase a product or agree with an ideology, a motivational speech helps to inspire people in a broader fashion, often without a clearly articulated end result in mind. As such, motivational speaking is a highly specialized form of persuasive speaking commonly delivered in schools, businesses, or religious, club, and group contexts. The Toastmasters International Guide to Successful Speaking lists four types of motivational speeches: hero, survivor, religious, and success (Slutsky & Aun, 1997). The hero speech is a motivational speech given by someone who is considered a hero in society (e.g. military speakers, political figures, and professional athletes). Just type “motivational speech” into YouTube and you’ll find many motivational speeches given by individuals who can be considered heroes or role models. The following clip (https://www.youtube.com/watch?v=vMlmbz8-_Xg) presents a speech by Steve Sax, a former major league baseball player. In this speech, Sax talks about his life as a baseball player, along with issues related to leadership, overcoming obstacles, and motivation. The survivor speech is a speech given by someone who has survived a personal tragedy or who has faced and overcome serious adversity. In the following clip (https://www.youtube.com/watch?v=NasfjwL8wTc), Becky Olson discusses her life as a cancer survivor. Becky Olson goes all over the country talking with and motivating cancer survivors to beat the odds. The final type of motivational speech is the success speech, which is given by someone who has succeeded in some aspect of life and is giving back by telling others how they too can be successful. In the following clip (https://www.youtube.com/watch?v=E52eIa1VSgQ), the then CEO of Xerox, Anne Mulcahy, speaks before a group of students at the University of Virginia discussing the spirit of entrepreneurship. A speech of introduction is a short speech that introduces another speaker. A speech of presentation is a brief speech given to accompany a prize or honor. The speech of acceptance is a speech given by the recipient of a prize or honor. A speech of dedication is delivered when a new store opens, a building is named after someone, a plaque is placed on a wall, a new library is completed, and so on. These speeches are designed to highlight the importance of the project and those to whom the project has been dedicated. A toast is a speech designed to congratulate, appreciate, or remember. A roast speech is designed to both praise and good-naturedly poke fun at a person being honored. A eulogy is a speech given in honor of someone who has died. A speech of farewell allows someone to say goodbye to one part of their life as they move on to the next part of life. An inspirational speech elicits an emotional state within an audience. Inspirational speeches include speeches to ensure goodwill and commencement addresses. A keynote speech is delivered to set the underlying tone and summarize the core message of an event. 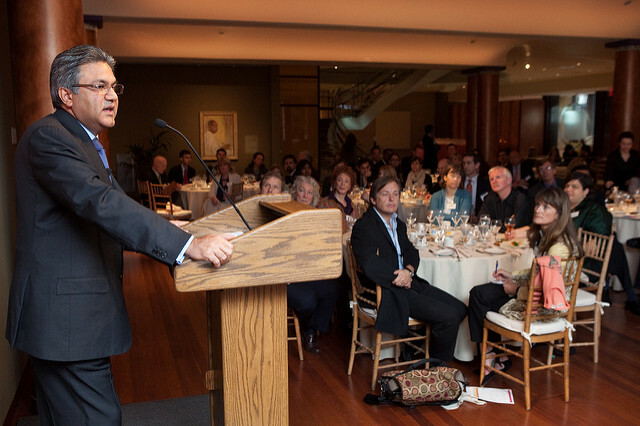 Keynote speeches include after-dinner and motivational speeches. Special occasion speeches may be common, but that doesn’t mean they don’t require effort and preparation. A frequent trap is that people often do not consider the impact these speeches can have on the occasion. For instance, a wedding toast not only leaves a lasting impression on the couple getting married but also all of the guests in attendance (not to mention it will likely be recorded and posted on social media). As a result, one may not prepare seriously but instead, stand up to speak with the idea that they can “wing it” by acting silly and telling a few jokes. Rather than being entertaining or commemorating the occasion, the speech appears ill-prepared and falls flat. To help us think through how to be effective in delivering special occasion speeches, let’s look at four key items to remember: preparation, adaptation to the occasion, adaptation to the audience, and mindfulness about the time. First, and foremost, the biggest mistake you can make when standing to deliver a ceremonial speech is to be underprepared or simply not prepare at all. We’ve stressed the need for preparation throughout this text, so just because you’re giving a wedding toast or a eulogy doesn’t mean you shouldn’t think through the speech before you stand up and speak out. If the situation is impromptu, even jotting some basic notes on a napkin is better than not having any plan for what you are going to say. Remember, when you get anxious, as inevitably happens in front of an audience, your brain doesn’t function as well as when you are having a relaxed conversation with friends. You often forget information. By writing down some simple notes, you’ll be poised to deliver a more thoughtful speech that matches the needs of the occasion. You are the maid of honor giving a toast at the wedding of your younger sister. You are receiving a Most Valuable Player award in your favorite sport. You are a sales representative speaking to a group of clients after a mistake has been discovered. You are a cancer survivor speaking at a high school student assembly. How might you adapt your message and speaking style to successfully mark each occasion in front of the various audiences in attendance? Remember that being a competent speaker is about being both personally effective and socially appropriate. Different occasions will call for different speech functions. As a speaker, it is important to understand the needs of the occasion and adapt your content accordingly. One of the biggest mistakes speakers can make is to deliver one generic speech to different groups without adapting the speech to the specific occasion. In fact, professional speakers always make sure that their speeches are tailored to each specific occasion by asking questions and investigating the details of each event or situation. When we customize our speech for the special occasion, people are more likely to remember the speech than if we give a generic speech. Understanding your audience remains one of the most critical aspects of preparing your speech for any occasion. Different audiences will respond differently to speech material. The more you know about your audience and the more you are able to adapt your content to their needs and wants, the more likely your speech will have an impact and you will effectively achieve your speaking goal. One of the coauthors of this text was at a conference specifically for teachers of public speaking. The keynote speaker stood and delivered a speech on the importance of public speaking. Remember, a function of keynote speaking is to inspire the audience. Though this particular speaking was highly informed on the topic and even entertained the audience, the speech did not go over very well with the audience. Why do you think this was? Speaking to an audience of public speaking instructors, a safe assumption is that they already believe in the importance of the subject. Thus, we can also assume that the speaker may not have considered the audience when preparing the speech, and therefore it is likely the keynote did not fulfill its function of inspiring them. There are very few times in life, whether it be academic, professional, or personal, that you will be given an infinite amount of time to do anything. This is an important consideration to keep in mind when preparing your special occasion speech (as well as your informative and persuasive speeches!). Special occasions often consist of more than just speeches. Each has its own conventions and rules with regard to time. Acceptance speeches and toasts, for example, should be relatively short (typically under five minutes). A speech of introduction should be extremely brief, just long enough to tell the audience what they need to know about the person being introduced and prepares them to appreciate that person’s remarks. Conversely, commemorative speeches, commencement speeches, and keynote addresses tend to be longer as they include more content and have different goals. When it comes to speech timing, the other three items we’ve discussed in this section can come in very handy. With preparation and practice, you can ensure your speech adheres to a specific timeframe. Considering your occasion and understanding your audience will also help you when crafting your speech and determining an appropriate amount of time for speaking. Think about a wedding you’ve attended when a toast honoring the couple has gone on and on and on, and everyone, including the happy couple, just wanted to get up and dance. There are also examples of instances when an audience may have been eager to be inspired and motivated but left disappointed when the speaker presented a quick and vapid speech. It can go either way, and that’s why it is important to be prepared, consider the occasion, and understand your audience. It is also perfectly acceptable to ask questions about the expected time frame for a speech. Either ask the person who has invited you to speak, or you can do some quick research to see what the average speech times in the given context tend to be. Slutsky, J., & Aun, M. (1997). The Toastmasters International® guide to successful speaking: Overcoming your fears, winning over your audience, building your business & career. Chicago, IL: Dearborn Financial Publishing. Stand up, Speak out by Leslie J. Harris is licensed under a Creative Commons Attribution-NonCommercial-ShareAlike 4.0 International License, except where otherwise noted.